So The Legal Genealogist is in the last stages of preparing for a really fun webinar, taking place later today, sponsored by the Friends of the National Archives-Southeast Region. It’s called “Inventing America – Records of the U.S. Patent Office” — and let me tell you, going through patent records gives you a bird’s eye view of the development of America like almost nothing else will. But there’s a real anomaly in those records, one that often confuses people. It’s the numbering system for some of the early patents, and the dates recorded on the records. 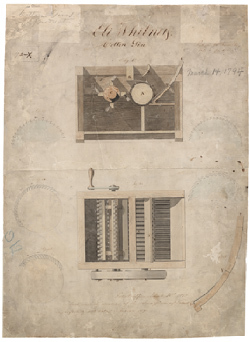 Take, for example, Eli Whitney’s patent for a cotton gin — shown in the patent drawing you see here. Designed to separate cotton fiber from seed, Whitney’s cotton gin, for which he received a patent on March 14, 1794, introduced a new, profitable technology to agricultural production in America. The cotton gin is a device for removing the seeds from cotton fiber. Such machines have been around for centuries. Eli Whitney’s machine of 1794, however, was the first to clean short-staple cotton, and a single device could produce up to fifty pounds of cleaned cotton in a day. This made cotton a profitable crop for the first time. You know what that sounds like, don’t you? So under the 1837 law any inventor who’d had a patent recorded before the fire was able to get it re-recorded afterwards. But now think about it. You’re the patent officer there in 1837. One guy comes in to re-record a patent. Another guy comes in to record a brand new one, never before recorded. How do you distinguish between those two? You can’t give the old patents the numbers they originally had — because they didn’t have any numbers at all. The pre-fire patents were only recorded by the name of the inventor.5 But now here you are, all modern in 1837, and patents are getting numbers. How do you number the old ones, while still numbering the new ones? That’s where the X files come in. The re-recorded patents were given X numbers, and whenever you see an X designation in a patent record, you know it was one of the ones initially recorded before 15 December 1836 and then re-recorded after 3 March 1837. Which explains how a patent issued in 1794 bears a date of 1845. The X files. Fun stuff. The X files are only part of the Patent Office fun stuff. Those patents are just a bit older. Grade Indicator, Patent No. 2,481,847, September 13, 1949. The inventor got the credit; the patent attorney made it possible. Inventing America is a lot of work and we keep doing it in the largest cities and smallest towns across the land in all kinds of ways. You are so right, John. One of the patents I mentioned was my own father’s patent, and despite what my nieces and nephews say, that wasn’t that long ago! Ouch. That’s funny. But ouch. What was the point of re-registering a long-expired patent? By 1845 the cotton gin patent was over 50 years old — and the original duration of patents was only 14 years? Part of the issue is not letting a later version be patented if an earlier version had already been patented. Inventors wouldn’t want some Johnny-come-lately claiming to have invented something they themselves had not only invented, but patented, years before.